So I’ve done a little life change, lost a bit of weight and taken up running again after a very long hiatus that included the birth of two children. The problem with being a foodie aside from the gradual and unavoidable weight gain is the absolute obsession with all things buttered and breaded. Lady Moss simply can’t find satisfaction in serving chicken and salad for lunch, steamed vege and fish every night. There is no passion and creativity served by reheating something in its plainest form adding nothing in the way of flavour or festivity. We decided within two weeks to find a way to inject fun back into food even if it couldn’t be in the form of cream or cheese. Last nights experiment was a new take on a very old Rainbow Lane favourite, Moroccan Lamb Shanks with Couscous. 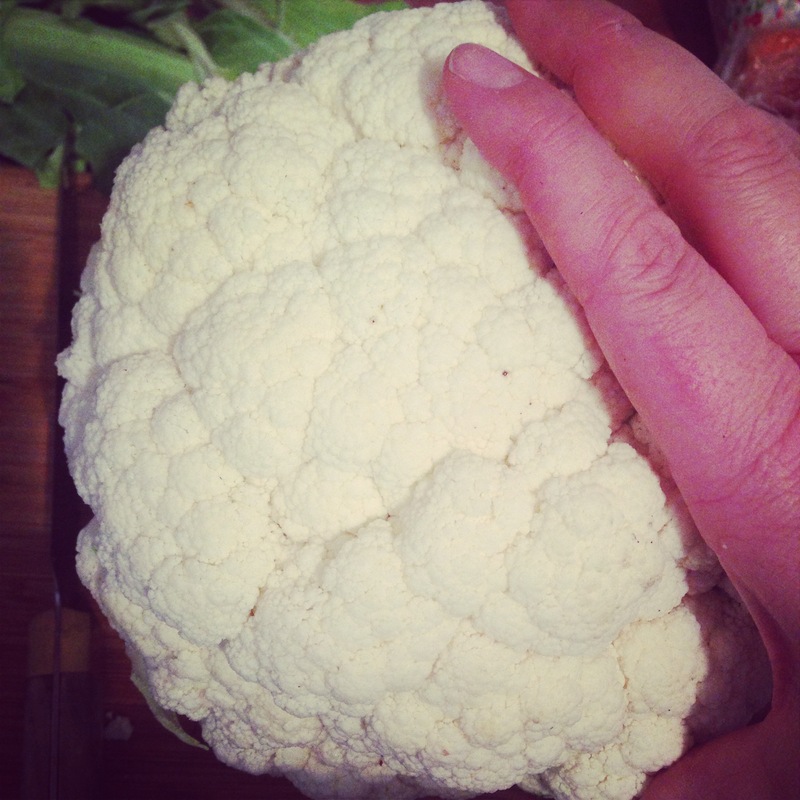 I was inspired by a lovely Sydney food blogger Jessica Sepel and her use of cauliflower as an alternative to carbohydrates to soak up the juices from any dish you’ve prepared. If it could be made into rice and mash surely I could roast it into couscous and if not, the lamb shanks would be tasty enough with a head of broccoli I had prepared with garlic and almonds. It took a full head of cauliflower to serve four adults with plenty left over for lunch the next day. Note that I was experimenting so amounts of spices etc are sadly lacking from my recipe but I find that’s the best way of cooking on a windy winters afternoon. A beautiful dish for entertaining, this could all be prepared in advance and brought to table for guests to help themselves. One lamb shank per person rubbed with ground cumin, coriander, cinnamon, salt and pepper. Heat a heavy based pan until smoking and dry fry your shanks on all sides until nicely caramelised. You want to remove as much oil as you can while injecting flavour. Remove the shanks and discard all excess oil. Create a bed of vegetables on the bottom of your roasting dish (I used my Le Cruset) – onion, celery, carrots, 3 cloves garlic and a thumb of chopped ginger before placing the shanks on top. Pour over a tin of crushed tomatoes and half a tin of water. Cover the lot in foil or a lid and place into a preheated 180 degree oven for at least three hours. Keep an eye on the meat and once its coming away from the bone all dark, thick and juicy throw over some more chopped carrots, sweet potato and chunks of red onion toss the pan juices over them to lubricate. Place into the oven uncovered to crisp up the outside of the meat, turning it halfway through until the vegetables are tender and soft. Cauliflower Couscous – so delicious its criminal. Take a full head of cauliflower and chop onto fairly small florets. Include the stalk in this. Pulse through your food processor in several batches. You want a crumbly consistency which can only be achieved by not overloading your machine. It will actually look like couscous grains. I used a tagine to dry fry mine, you could use a pan just ensure its nice and hot. Resist the temptation to add olive oil, you are wanting to add a nutty flavour to the cauli by caramelising it, you want the pan to colour it up and dry it out. Add salt and continue turning the grains for a good twenty minutes if necessary. In the meantime soak a good pinch of saffron threads in 4 tablespoons water. Add this to the cauliflower along with a 1/2 teaspoon of cumin, coriander and cinnamon. In a separate hot pan, dry roast a nice handful of almond flakes until nicely toasted. Chop up a handful each of dried dates, apricots, cranberries and spring onions. You could add anything you like here, currants, sultanas whatever you fancy! Once the cauli-cous is done pull it off the heat and throw over your lovely fruit and nut mix. Check seasoning, add lovely chopped coriander and you’re done! I like to serve with a side of greens simply steamed to crunchy perfection. 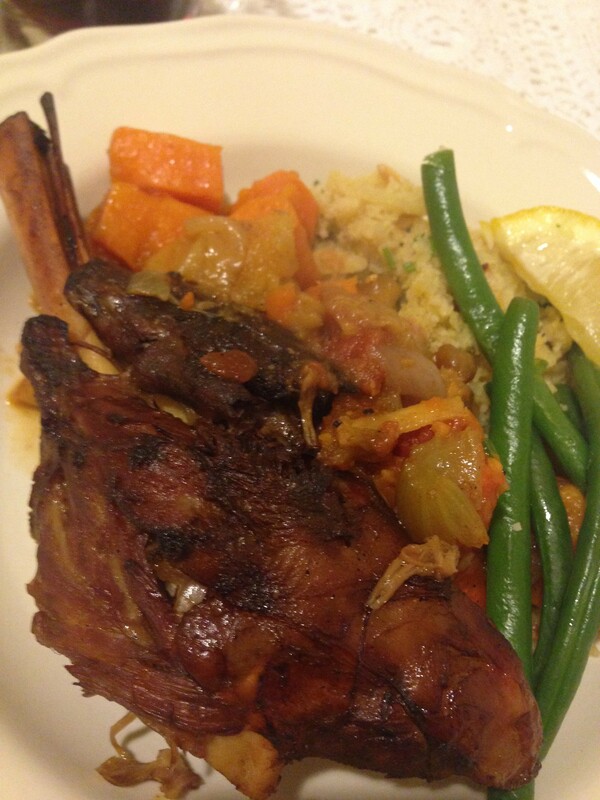 Let guests help themselves to a haunch of meat, soft juicy veges and your healthy, gluten free couscous. Make sure you pour over a few spoons of pan juices. If like Lady Hunt you are vegetarian, the couscous is a completely vegan option on its own. Our guests included two very fussy men-folk with zero interest in fancy health food. Both not only couldn’t tell the difference between regular couscous and the cauli-cous they didn’t stop shovelling in forkfuls to ask. A huge success if you ask me!